The U.S. Navy will soon release an update to the Cooperative Strategy for 21st Century Seapower. 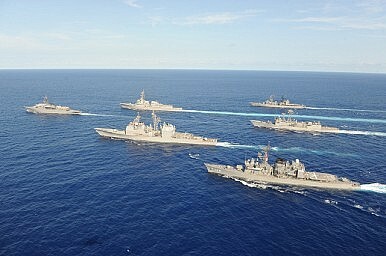 Chatter suggests that the U.S. Navy will soon release an update to the Cooperative Strategy for 21st Century Seapower. The Cooperative Strategy envisioned the maritime commons as a space for collective action, in which productive rules of the road could lead to partnerships that could help every player win. The Cooperative Strategy made provision for “bad” actors, but at its heart sought to include and acclimate, rather than isolate. Thus, the strategy was, in some sense, dependent on the willingness of the world’s major navies to agree on several critical areas, including the reality of U.S. maritime leadership. As Bryan McGrath argues, the most hopeful projections of Chinese maritime behavior have not panned out. At the very least, China has expressed a desire to play a larger role in the formation of global rules than the U.S. was willing to allow, and has also demonstrated an interest in carving out its own space for exceptional behavior. At the same time, we’re a long way from a zero-sum maritime world. And as Andrew Erickson and Austin Strange have argued, Chinese naval behavior in the PLAN’s immediate neighborhood has differed considerably in tone from its more distant operations. In the Gulf of Aden and in the Mediterranean, China has more or less been a model maritime citizen. This suggests that there are still considerable potential gains to a cooperative approach that, at least on some issues, includes China as a serious contributor. And so how do we keep the good parts while revising the excessively optimistic elements? Not unlike a jet fighter, a strategic document becomes heavy, unmaneuverable, and perhaps even a bit expensive the more stuff you stick onto it. Still, I would add to Bryan’s argument that the updated strategy needs to clearly lay out how the USN understands its relationship with other navies around the globe. This can be framed around the following question: What we can ask of foreign navies, and what, as a routine matter, they can ask of us? There is still a great need for developing an over-arching maritime framework that can guide the USN’s approach to the other major navies of the world. Indeed, the growing strength of the JMSDF, the ROKN, and the Indian Navy demands a strategic vision on the role of partners. Whether conceived of them in terms of their fighting strength, their ability to maintain the maritime commons, or their capacity for building rules and norms, the existence and attitudes of these navies will form a critical part of the strategic seascape for the USN. Planning for how to manage them has an impact on every mission the USN conducts. I would also like more on questions of rule-building and norm construction. The maritime sphere has of necessity, and for a very long time, been a norm governed space. Even when those rules are honored in the breach, actors understand their importance, and often content over interpretation and implementation. Indeed, research indicates that some autocratic regimes can manage international cooperation. Many of the concepts embedded within the Cooperative Strategy remain sensible, even critical to a liberal international order. At the same time, the idea that maintenance of the maritime commons requires partnership means that others have a voice. Specifying how and why that voice matters is key to appreciating a cooperative approach to maritime strategy. A U.S. carrier strike group showed off its ability to rapidly launch fighters in the South China Sea.